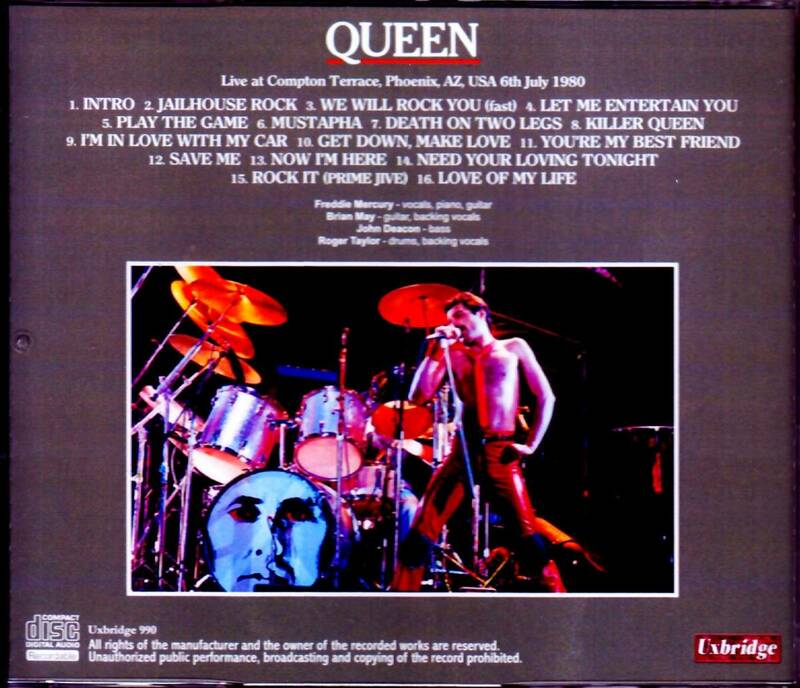 Recorded: Live at Compton Terrace, Phoenix, AZ, USA 6th July 1980. Comments: From US 'The Game' tour summer 1980. This pro-cdr contains the first part of the concert. A world tour of the great prime that opened its doors with the release of the blockbuster "THE GAME". The live album which carved the start dash is appearance. 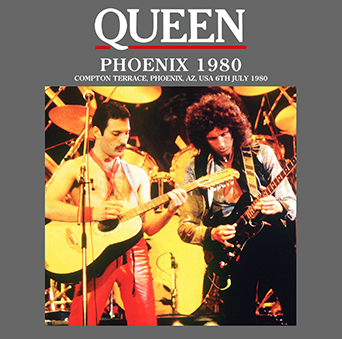 It is "July 6, 1980 Phoenix performance" that is included in such a work. It is the masterpiece audience recording. This tour is just the heyday. The single "Crazy Little Thing Called Love", released last year, won the No. 1 spot in the United States in February, and "THE GAME", which was released on the momentum, was also a big hit. In the middle of the tour, single "Another One Bites the Dust" is ranked No. 1 in the United States, and even the final album "GREATEST HITS" is a hit. First, let's check the show's position in the Golden Age. June 30 "THE GAME" release. December 8 "FLASH GORDON " release. October 26" GREATEST HITS " release. ・ November 24th + 25th: Montreal (2 shows) Both professional filmed & recorded. Officially released on 2cd, 3lp, DVD and Blu-ray. This is the whole picture of "THE GAME TOUR 1980-1981". The phoenix performance of this work is the fifth performance of the first part "North America # 1". It was the oldest record of "THE GAME TOUR", and it was a concert one week after the album was released. The single "Another One Bites the Dust" is number one in the United States in October 1980, so it was in the middle of the right as the golden age that opened the curtain began to overheat. This work that recorded such a show is a truly wonderful vintage audience. Although the recording itself has long been known among the core collectors, this work is a new master excavated recently, and the clearness is overwhelming anyway. The "Compton Terrace" that became the scene is the late open-air theater. Because there is neither a wall nor a ceiling that reflects the sound, the output sound emitted by the PA reaches the hand without clouding, and the details are also picked up directly with vivid details. Although the beauty can not be expected for the ringing, the core is terribly on and sharp, and the singing voice is crisp to the nuance of one syllable rather than one word of the lyrics. Of course, the guitar / bass / drums are neatly mixed without being mixed at all, and the sound effect of a little synth is vivid even to strong and weak movement. It is such an ultra-clear sound that I think AM broadcast. This work is what refined such a new master with further careful remastering. Of course, I made the balance without making senseless sound pressure. As a matter of fact, in the original sound, the left channel was falling high. I adjusted it and faithfully reproduced the sounds that would have been more natural and reach the scene. The show drawn with the crystal clear sound is hot again! It seems that the tour has just begun, and it has not reached the summit that "I will do it no matter what I do", but there is plenty of momentum to run up the hill at tremendous speed. Freddie is in good shape and has high tension. Although only the momentum is about to break off, I am not used to a new stage, so I will not go there ...... It is a stop show. And the set is also delicious because of the early tour. There are also "Mustapha / Death On Two Legs" and "You're My Best Friend" which can not be heard even in "QUEEN ROCK MONTREAL", but still it is "Need Your Loving Tonight" "Rock It (Prime Jive)" will be delicious . Both are the numbers that symbolize the early 80's, but in particular, "Rock It (Prime Jive)" is valuable as it only hides up to the 1981 Japanese performances after being played in a number of performances in the early stages. Of course, since this work is the oldest recording of "THE GAME TOUR", these two songs "Play The Game (intro piano also feels interesting)" is also the earliest version. It looks like it's full of delicious points, but it is as short as about an hour. It seems to have been recorded with one tape for 54 minutes, and recording ends in the intro of the end of the main part set "Love of my Life". Just because the content is wonderful, now the highlight, and the encore of furious! It is sad that it will end at the place where it is rising .... Unfortunately, only one recording of this show has been found, and it will probably not be possible to listen further. Such shortness is difficult to do, but it is difficult to replace the taste of being able to experience 100% of the entrance to the Golden Age over about an hour. It's also one of the tour's best real sounds. While a little maniac, if you become a mania, you can not miss it. Its highest peak. By all means, please experience at this opportunity carefully. ★ The fifth performance of 80 years "Game Tour". Among the existing sound sources, it is the earliest valuable sound source. Sound quality is also good.